Gutters and downspouts are two unappreciated heroes of our homes. They don’t only protect our roofs, but they also greatly reduce foundation issues. As you might expect, faulty gutters can lead to expensive repairs. Luckily, active DIYers can replace or install new gutters and downspouts on your own. It may take a weekend to complete, but you’ll save hundreds from paying a gutter pro. Nevertheless, if you hire a pro, they’ll likely charge at least $400 to install new gutters and downspouts. Next, you have to measure around your roof. Again, if you’re replacing existing gutters, remove them and measure. Note that gutters are generally sold in prefabricated lengths of 5, 10 or 15 feet. Similarly, measure the distance of your downspouts. If you’ve noticed flooding around your house lately, increase the downspout extension. It should end at least 4 feet away from your house. Also, before you remove your existing gutters, note how many end caps and corners. These are separate pieces that must be attached to your new gutters. Don’t go hoping on that ladder just yet. We have to assemble the gutters before we attach them to the fascia board. First, we have to work with the corner pieces. Take your new gutter and use your tin snips to cut according to the length needed. The top of the gutter is called the notch. Cut two inches from the end of the notch so you can attach a corner piece. Now, take your corner piece and apply gutter sealant along the inside edge. Just like glue, apply a heavy dose to ensure a solid transition from the corner piece to the gutter. Attach to the gutter and hold in place for 10 seconds. Then, we have to attach the pieces with the rivets. Drill 3 to 4 small, 1/8” holes that will connect the corner pieces and the gutter. Install the rivets with the rivet gun. Finally, add some roof sealant over the rivets on the inside of the gutter. Beyond the corners, you can use the same process above for attaching two gutter pieces together. Depending on the size of your roof and gutters purchased, you may have to attach multiple pieces. For the gutter ends, use end caps instead of corner pieces. Make sure the gutter runs an inch past the fascia board. Attach the end caps just like the corner pieces. Before we install anything, we have to prepare the downspouts. First, measure from the top of the fascia board to the ground. Then, add four inches. This is the length of your downspout. If you need to cut, use the tin snips. Now, we need to make a hole in the gutter so water can head from the roof, to the gutter, down into the downspout. Turn your gutter over. Mark your desired downspout outlet location. Put your downspout outlet on the gutter and trace around it. You’re going to cut around this line. Use red and green tin snips to cut along this line. Put the outlet in the hold and drill two holes for rivets. Remove the tube, add sealant around the edges and place into the hole. Hold for 10 seconds. Then, install the rivets just like you did earlier. It’s finally time to attach the gutters to the fascia board. Head up on your ladder and first mark the gutter’s slope. Gutters should be installed with a very small slope so rain can freely flow from the roof to the gutter and eventually to the downspout. Start at one end of the fascia board. Install a nail at the top. Measure 10 feet across and move down ¼”. Install a nail at that spot and do the same for every 10 feet. Once completed, take a level to ensure it matches. The bubble should be off-center toward the high side. Now, take your gutters and attach them to the fascia board using the hex head screws. The screw sizes depend on your gutter material, but 1-1/4" is ideal. Install one screw every 2 to 3 feet. 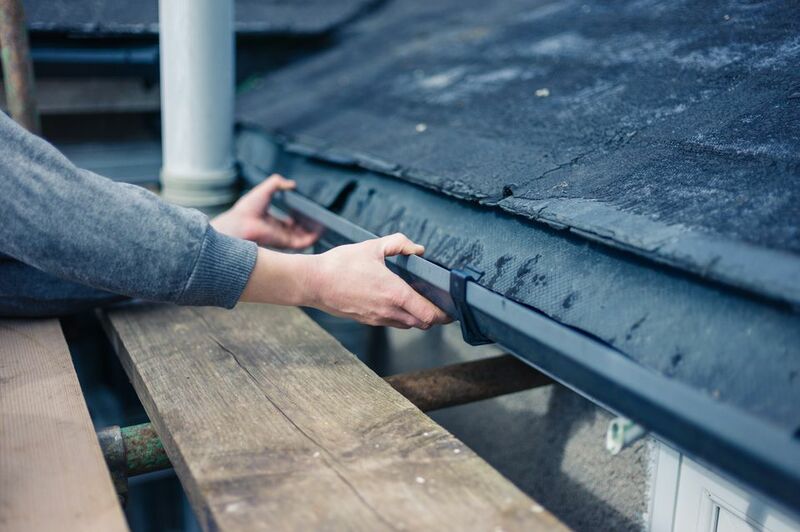 If you’ve noticed leaks or stains along the edge of your roof, now is the time to install new flashing (gutter apron) or other gutter protection systems. The apron goes under the roof shingles and over the back edge of the gutter. You can just lift the shingles and place the flashing in place. To finish off the gutter, install gutter hangers through the apron, into the fascia board. This ensures an extra layer of protection to your gutters and confirms your flashing won’t go flying off your roof during the next storm. You should see a downspout outlet hanging from your gutter at this point. Now, we have to attach the rest of the downspout. Take the elbow of your downspout and screw it into the outlet tube. If the elbow does not extend to the house, you have to add a small downspout piece. Measure the distance and then cut a piece to length with a hacksaw. Attach them together, but ensure they overlap by at least one inch. Now, take your crimper and clamp down on the inside of your small downspout piece. This piece will be attached to your elbow and is the beginning of the vertical portion of your downspout. Crimp three times along the inside of this short downspout piece. Next, you have to attach U-shaped brackets to the house that will hold the downspout in place. Install brackets going down the house, from the gutter, every six feet. Attach the brackets to the house with stainless steel screws. Install all screws and then put together the downspout extension near the ground (six inches above). Again, the extension should run at least four feet away from the house. Finally, attach the downspout to the brackets with hex head screws.